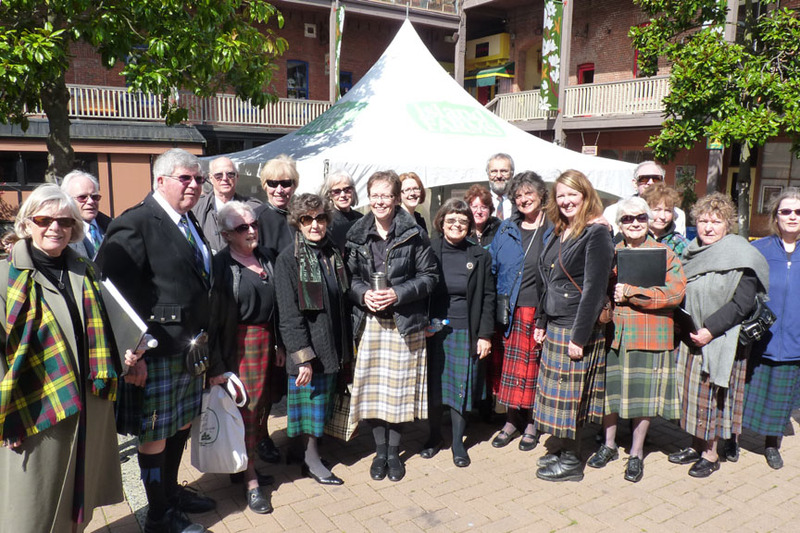 Guth Nan Eilean, the Victoria Gaelic Choir, was formed in 1997 with a core membership of 24, and now numbers about 30 active members. Over the past few years the Choir has performed at many social gatherings and competitions, such as Robert Burns Suppers, the Victoria Highland Games, Féis Shiàtail, Craigdarroch Castle, Government House, Mòd Vancouver and the Royal National Mòd in Scotland. The Mòd, a huge music festival involving nearly 100 Gaelic choirs, takes place every year in a different location in Scotland. Guth nan Eilean has had three Directors since its inception. Wendall Clanton came on board within a few months of the inaugural meeting in 1997 and stayed with us until May 2002. In June 2002 Douglas Hodgkinson joined the Choir and was our music director until June 2007. Janice Beckett became our music director in 2008 and brings her love of Gaelic music and excellent teaching skills to the job. We have a busy schedule of performances in retirement homes and care facilities, cèilidhs, concerts and Burns Suppers, and her encouraging manner has helped us make some great music for our audiences. Throughout all these years Ann Reilly, formerly of South Uist, has been our Gaelic instructor and mentor. We are blessed to have had such excellent tutelage, and we owe a huge debt of gratitude to her for the amazing progress we have made since 1997. In 2001 the choir travelled to Scotland for the first time to compete at the Royal National Mòd in Dunoon. It was wonderful to be amongst Scottish choirs of the highest quality, and make new friends along the way. We learned a great deal about Gaelic singing from those experts. In October 2003 the Choir competed successfully in the 100th Royal National Mòd in Oban, Scotland. Under the direction of conductor Douglas Hodgkinson and Gaelic Tutor Ann Reilly, the choir won the prestigious Margrat Duncan Trophy for highest marks in that competition, the first time in the fifty-two year history of the Mòd that the trophy had been won by a choir from outside the UK. The choir also won the John McNicol Memorial Trophy for highest marks in Gaelic, the Staff Finders Quaich for highest marks in music, and the An Comunn Gaidhealach Centenery Baton for best conductor. In the category for choirs from outside Scotland, the Victoria Choir took first place winning the Celtic Congress Salver. As a final honour, Guth nan Eilean had the privilege of opening the prestigious Final Concert by leading an audience of over one thousand in the singing of the traditional Gaelic gathering song of the Gaels, Suas Leis a’ Ghàidhlig– a great honour indeed. Along with choirs from the United States and Scotland, the choir has participated in Mòd Vancouver (which is, unfortunately, no longer running) many times over the years. In 2005 the choir went to Stornoway, Lewis where they enjoyed fine Hebridean hospitality... and good weather! Another trip to Inverness in 2014 is currently being investigated. Guth nan Eilean continues to enjoy the family atmosphere which has developed among us over the years through singing together. We strive to pass on our joy of our Gaelic musical heritage to others through our activities. We shall continue to live by our motto, O Teannaibh Dlùth is togaibh fonn! O Come Closer and let us sing a song!